A new study by the Union of Concerned Scientists shows that driving an electric vehicle can save the average American $770 per year. The study focused on the 50 largest cities in the US and found a range of annual savings between $443 and $1,077 per year, depending on local gasoline and electricity costs, with a median of $770. Among other findings, it also showed that electricity prices are more stable than gas prices, that EV purchase prices are going down as the industry matures, and that EVs can often be cheaper to maintain than comparable gas vehicles. The study also tallied up the “gallon-equivalent” cost of electricity, comparing how much a gallon of gasoline would have to be in order to be cheaper than electricity. 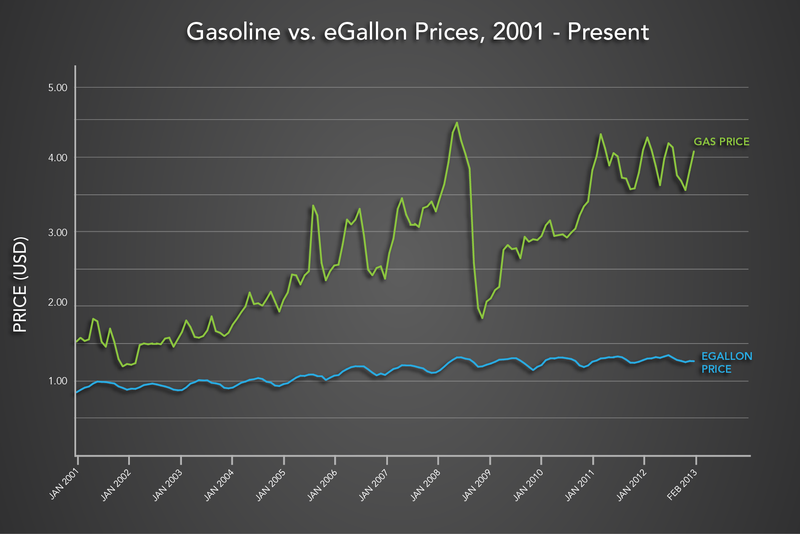 The median price found in the study was 90 cents per gallon – a gas price which hasn’t been “normal” since around the turn of the millennium, and even then only in some regions of the US. The main difference between the eGallon and UCS’ findings is that UCS also takes into account “Time of Use” (TOU) plans, which are special rate plans where electricity providers offer discounts for electricity which is used at night. Electricity is generally more expensive to generate during peak hours, so utilities tend to like electric vehicles, since they charge at night and help to flatten out the “duck curve” of electricity generation. Because of this, EV drivers can get cheaper electricity and sometimes additional purchase incentives from their utility. The UCS study showed that when taking into account TOU rates, “gallon-equivalent” costs can be as low as 25 cents per gallon on the nation’s cheapest electricity providers. Even in the most expensive cases (Los Angeles and Hawaii), electricity is still more than a dollar cheaper on a “gallon-equivalent” basis. The study also makes recommendations to drivers, utilities, policymakers and automakers. To drivers, it recommends that they find out about available rate options, including TOU rates, and availability of special incentives from states, local governments and utilities, as there are more incentives out there than the public is generally aware of. To the other groups, it recommends offering special rate incentives to coordinate charging with electricity availability, charging solutions for those who cannot charge at home, and programs to ensure manufacturers offer a diversity of EVs at different price points and vehicle classes. You can see the full report or executive summary on the UCS website. There’s also a calculator showing the average savings in your city on the study’s main page. There are other calculators with varying levels of detail around the internet, for example there is one on Tesla’s website for Model S and X and a pretty detailed tool at BeFrugal.com which attempts to account for total cost of ownership (for both, it’s beneficial to know your current electricity price). This may be no surprise to our readers, but some of the public hasn’t gotten the message yet as to how much cheaper driving electric can be. The potential to save up to $1,000 per year for the average driver is pretty significant. For drivers who drive fuel-inefficient vehicles, or who drive more mileage than average, or who live in areas with low electricity rates or high gas prices, the numbers can be even higher. With purchase prices falling, and with cheap leases available and good prices on the used market, it starts looking like an economic no-brainer to drive an EV. This is probably why 6 of the 10 fastest-selling used cars in the US have plugs. Add on incentives like California’s $2,500-$4,000 purchase incentive (which applies to cars purchased or leased >30 months) and SoCal Edison’s $450 rebate, or various other incentives which you’ll want to look up in your local area, and it starts to look like it’s not just exhaust coming out of that tailpipe, but hundreds or thousands of dollars of your hard-earned money every year. It’s time to go electric.